Spiders…we see spiders. Any ID would be great, thanks. Derek and I are quite astounded by the Mauritian Thorn creeper that has made very intense inroads to the Dargle Forest. We have noticed different plants and trees thriving during this hot dry season we are experiencing, and from our property below the bush, we can see how this invader has run riot. How one eradicates it must be a huge task, as I should imagine spraying is out, and it probably would have to be attacked manually. It could be a touchy subject, however, and I’m certainly not pointing fingers at anyone. It’s just awful to see the weed engulfing the bush in a certain area. It’s bad enough having to cope with our common weeds that love our climate. No sooner does one have them cut or pulled, we have some heat and rain, and they are off again. A happy corner of the garden. Hesperantha coccinea, Scarlet River Lily, growing near a down pipe. This little dove arrived out of the blue and decided that life would be great living with us. I think it’s a juvenile Red Eye and she shyly took food from us and would settle near by if we were on the veranda. She even alighted on Derek’s shoulder, looking for seed. She wasn’t too excited about Scruffy Parrot’s food and he wasn’t too excited about her. I presume that someone had hand reared her in our vicinity. She was around for a week then disappeared. This snake was investigating the passage window. I passed right next to it on my way outside , without noticing . Once outside I noticed the dogs looking at something and thought the Grandchildren had put a plastic snake there to give me a fright. However , the snake took fright, dropped to the ground and took off in a flash. This Hilaria bush next to the veranda is a feeding station for the birds. This chap took up residence for a few days . He had a ready supply of flies that were attracted by the apple. I then saw him climbing higher one morning and he hasn’t been seen since. I moved a rock off of a trail, and found an entire colony of black ants underneath. Within a couple of minutes they had moved all the eggs underground into the tunnels. Cousins came to visit, and we found a whole bunch of little mushrooms under an old log in the sheep camp. Sunset shot of Inhlosane, taken from just above Lions River one evening. past month and managed to capture a Duiker. We’ve seen 8-10 baboons on a couple of occasions over the past month over on the Rathmore farm. We have lived in the Dargle for about 12 years now and have never seen them there before. The early morning chill and long, still evenings are a delight that (almost) make up for the scorching days. Flowers are behaving differently this season, and there seem very few around. I did spot these treasures when I was brave enough to venture out in the sun. Not sure what species this Asclepias is, but it was an exciting find. With the drought seriously affecting the amount of wild food available, I am certain the berries did not last long on this Searsia (Rhus). Didn’t spot the crab spider and beetle on the bright pink Watsonia densiflora until I loaded it onto my computer! Kniphofia laxiflora have flowered profusely this summer. Delicate Polygala hottentotta has also been more visible than usual. Sleek and shiny Drongo on the lookout for insects. Weaver’s nest between prickly Berkheya in the wetland. I saw five Reedbuck, one Oribi, one Common Duiker and one male Bushbuck. In shady areas there have been heaps of mushrooms – obviously the combination of wet/dry/hot has been ideal for fungi this year. Gorgeous Golden Orb Web Spider just outside my window within easy watching distance. Lucky me. An Antlion with beautiful lacy wings sensibly sought refuge in my cool cottage. The Blue Crane have been visiting the dam about once a week. We saw the juvenile flying over the house about 10 days ago for first time. It must be about 3 months old now? One hot morning about 20 white stork flew in and had a bath in the dam. Lots of grooming afterwards with wings outstretched. Pat saw 7 amur falcons flying over the farm. At the beginning of feb one of the juvenile swallows whose nest was on the lampshade was still sitting on the glass shade even though the nest had fallen off. How he balanced there all night I do not know. Looked very uncomfortable. Pat saw a Black duck with ten ducklings – whenever I went down to the dam to look for them they were nowhere in sight. The giant kingfisher has been visiting every few days as has the hammerkop, jackal and steppe buzzards sitting on the dead tree. A pair of crested crane in the dam one evening with a number of reedbuck grazing round about. We have about 4 or 5 reedbuck at the dam each evening. Pat climbed the hill behind the house late one afternoon and counted 13 reedbuck which is encouraging. I have only seen 2 duiker this month. On 22nd feb I photographed one of our juvenile Amethyst Sunbirds – so exciting to see his “amethyst throat”, so another male. 9 weeks since leaving the nest. On the same day Pat came racing up to the house and told me to grab my camera. He had been driving along the D18 bordering our farm when he saw something white in the land. His first thought was a dead calf, so he went to check it out. It turned out to be a dead White Stork that had been killed, plucked and eaten. Just the flesh. The organs were exposed. Pat then started looking for the raptor and saw a beautiful Martial Eagle sitting on a dead gum tree about half kilometre away, being harassed by black crows. I got out of the truck to take photos and he was very unconcerned about my presence. What a beautiful specimen. We have not seen one in the 33 years of living here. He returned 2 days later sitting in same tree. It was a very hot day but could not see if he had made a kill. (I will post these pics next month) We were thrilled to see this eagle in this area as it seems to be very vulnerable. After this the white stork disappeared for a week – probably traumatised at seeing this incredible kill. We thought the jackal would eat the rest of the stork that night, but they didn’t. We haven’t heard the jackal in quite awhile. On the 24th there was a huge gathering of White-throated Swallows sitting on the electric line at sunset. There were simply hundreds. Quite a number also sitting on the gutters and roof of the house. A Grassbird visited us for the first time. I was drawn to the window by its beautiful singing. Just after that the male Malachite Sunbird joined the chorus. Our 3 Buff-streaked Chat juveniles are changing colour. One morning a juvenile Cape Robin-Chat flew into the verandah door. I picked him up as he was stunned and put him in a box for a while to settle down. I let him out and he flew off and sat on my hanging basket for about 5mins before flying off. Thankfully okay. We have had 2 swallow nests outside our study. Pat put up a perch. There seemed to be 5 juveniles and lots of noise for about a week while they were still learning to fly. Some would sit on the perch and the others on the gutters and chimney. Black eyed bulbul eating peaches. Reed cormorant, and Garden Commodore butterfly. Saw 2 pairs of Oribi, of which 1 pair had a baby with them. I spotted them when riding on the top fields of Carlisle farm. Also saw many pink Watsonia, and the orange Red Hot Poker. I saw 30 White Storks in the hayfield one afternoon. 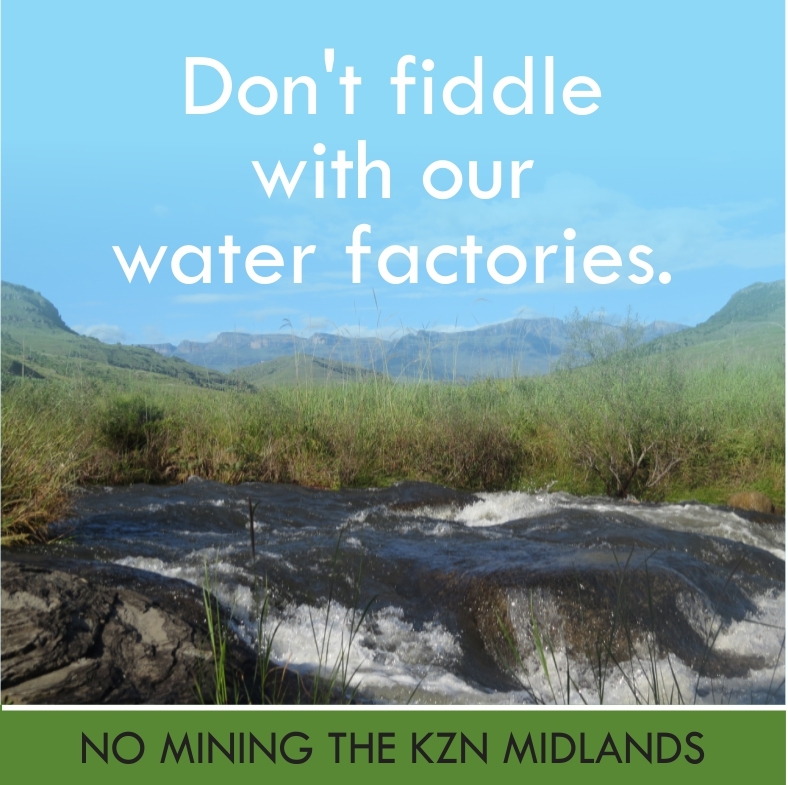 Although we had some heavy rains in the beginning of February and our dams filled up ever so slightly, it has not been enough to get the little streams flowing and they are just tiny trickles, so the dams are still very low. Tyrone found some huge land snails one rainy day. I had a lovely viewing of one of the little ‘ball’ millipedes, which took forever to open up and scuttle off again. The 50/50 film crew were back here this month to finish the filming for the upcoming programme on the Anti-fracking Angels. This time they brought their drone along as well and flew it over the lovely waterfalls on the the Furth River gorge. Some photos of the ‘Angels’ and the chaps with the drone, thanks to Pandora Long. This entry was posted in Uncategorized on March 22, 2016 by Midlands Conservancies Forum. Thanks Twane, for compiling our collection of treasures for everyone to enjoy. Love the variety of big and little creatures, some obvious and others hidden. A very interesting and most exciting report. Beautiful photos – loved the mushroom head!